Guest Blogger – Mairi MacSween, Mairi MacSween Designs. I design and create handmade stationery for weddings or corporate events including invites, reply cards, order of service, menus, place cards and table plans. Based in a studio in Leith, the stationery incorporates my own photography and illustration and is handmade using the finest quality of materials. Established eight years ago, my reputation is built on the distinctive designs, high quality stationery and personal service. I accept commissions from throughout the UK. I offer an excellent level of service where I work closely with the client to create high quality stationery. This sets the tone for their special day and reflects and compliments the elegant surroundings. I provide an innovative and flexible approach, working with the client’s ideas and within their budget, either to create a bespoke design or to customise one of our existing designs. A bespoke design could incorporate an image of your wedding venue, an art work based on your theme or a motif featuring your colour scheme – an opportunity to create a one-off, unique design to set the tone for your special day. 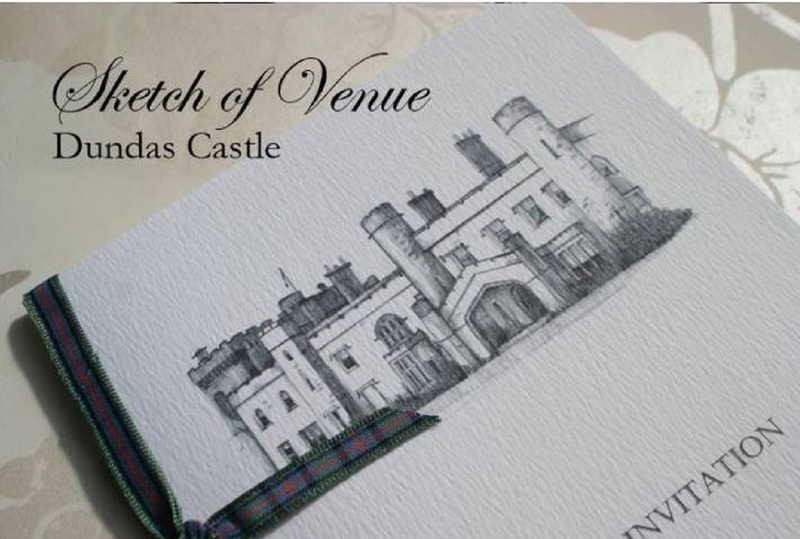 Recent commissions include an exquisite foil blocked monogram of the couple’s initials, a beautiful pen and ink sketch of Dundas Castle and an elegant watercolour of a thistle and rose to reflect a Scottish and English wedding. I have a huge selection of double satin and tartan ribbons, card and typefaces available so that you can get the stationery exactly as you would like it. The stationery is individually handmade so you can order the items you require. I also offer a printing service where I can print your guests’ names and addresses on your invites for you for a truly professional feel. The Save the Date and then the Invitation to your wedding, party or event could sit on the recipients mantle piece, be attached to the fridge or even carried around in a handbag from the moment it is received to the day of your event. Your stationery sets the tone, could introduce a theme or colour and gives all the vital information for your day. Mairi MacSween Designs will help you create wedding or event stationery that you will be proud of and that will encapsulate your vision perfectly.